Freight Zone File Maintenance allows users to set up a Freight Zone File that contains all the information about locations associated with zone numbers for all the modes of the carriers. This is a predefined file containing zip codes, 91001 to 91899, associated with zone numbers for all the modes of UPS, RPS, Federal Express, and U.S. Postal Service. It also includes a check flag to verify at what zip codes the service is available for each mode of the carrier. If you are not in this area, most of the setup should meet suit your needs. However, you should print an edit list, and change the necessary portions to meet your specifications. Enter the starting zip code or state, etc. for this zone number (1 to 3 characters). 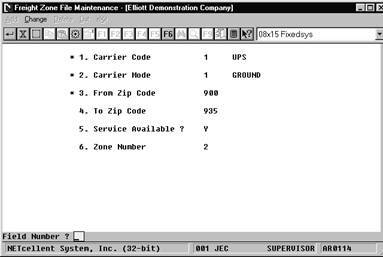 After carrier code and carrier mode are entered in fields 1 and 2, the description of zone break-down method is retrieved from Carrier Mode File and displayed in this field. If the zone method description is Zip Code, then you enter the starting zip code. Similarly, if description is State, then you enter the starting state. Enter the ending zip code or state, etc. for this zone number (1 to 3 characters). After carrier code and carrier mode are entered in fields 1 and 2, the description of zone break-down method is retrieved from Carrier Mode File and displayed in this field. If the zone method description is Zip Code, then you enter the ending zip code. Similarly, if description is State, then you enter the ending state. If this combination of carrier and carrier mode provides services within the “To and From” range, enter “Y”; otherwise, select “N”. Enter the zone number defined by the carrier that represents your location. This must be a valid zone number created in the Freight Rate File Maintenance for each mode of the carriers.